Don Sparks - AMANites.. lets stay connected! 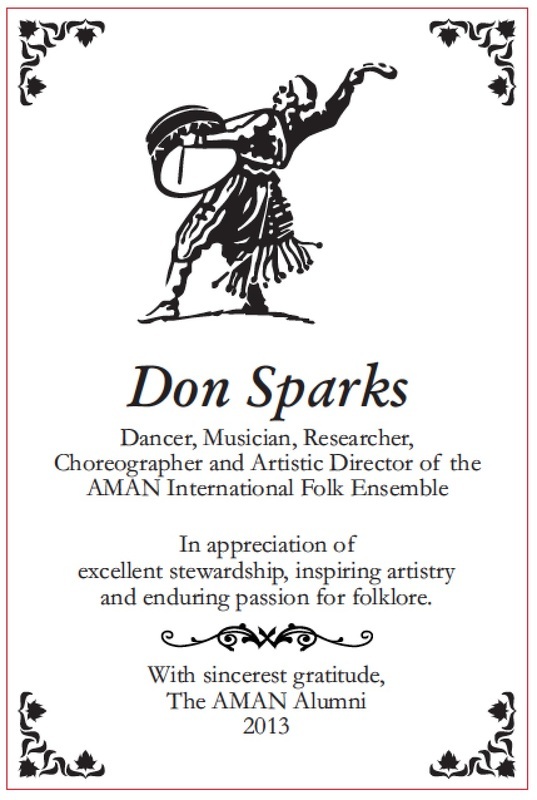 Don began his performance career in ballet, becoming a soloist with Ballet Arizona, Pasadena Dance Theatre, Riverside Ballet and the Sacramento Ballet. He danced as a guest artist in several western ballet companies, and was an Equity theater/musical comedy performer. During his years as a folk dancer, he often conducted folk music and dance workshops nationwide, among them several trips to Alaska, Utah, and West Virginia. Don joineed AMAN Folk Ensemble in 1977, and demonstrated the artistic flexibility to participate in and direct the full range of AMAN’s presentations. With AMAN, he performed as a dancer, solo singer and musician, and served the company’s management as a Choreographer, Men’s Dance Director, Music Coordinator, Associate Artistic Director, and Artistic Director.